At this year’s NRF, Samsung Electronics America conducted a survey of attendees, the year’s biggest retail event, to discover their opinions on a range of topics — including their top technology priorities for the coming year, the IoT challenges they would like to overcome and if they think online retailers will require a brick-and-mortar presence going forward. The findings reveal an industry that is shifting technology priorities from the back-end to the front-end — with the creation of in-store customer experiences, and the introduction of new digital technologies into physical stores, now top-of-mind. Back to Brick-and-Mortar: Sixty-six percent said “yes” when asked if online-only retailers will require a brick-and-mortar store presence moving forward, echoing the trend of online retailers increasingly adopting a physical store strategy. It’s All About Experience: Survey respondents ranked “deploying new digital experiences for customers” as the top in-store technology priority for 2018, followed by “improving in-store data collection and analysis.” Moreover, when ranking the top reasons for retailers to implement IoT in their store, “enhancing in-store customer experiences” landed at number one. In addition, Samsung surveyed NRF attendees for their thoughts on pop-up stores, which have become useful strategies for retailers to create a temporary physical location to launch brands and sell products. 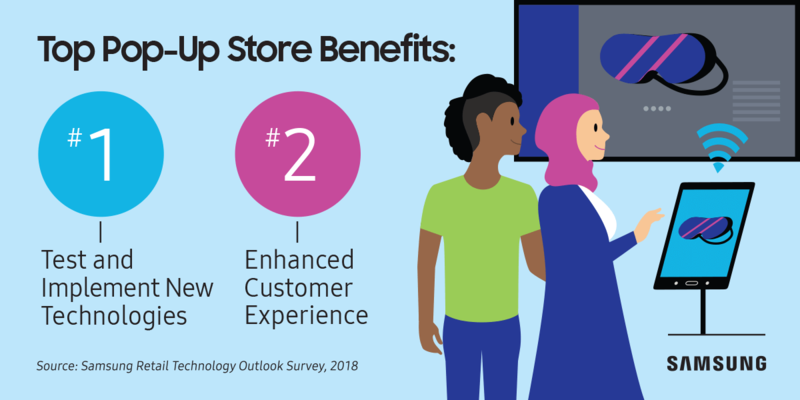 More than half (53 percent) saw the greatest benefit of pop-up stores as “offering a way to experiment with and implement new digital technologies.” The second highest benefit was “enhancing the customer experience,” which totaled at 28 percent. Learn more about how connected pop-ups can drive engagement and improve brand retention.